Similipal Wildlife- Taking its name from the abundance of semul or red silk cotton trees that bloom vividly here, the Simlipal National Park is home to three of India's biggest animal species --Tiger, Asian Elephant and Gaur. Spread over a sprawling area of 2750 sq. kms, the park is at an altitude of 559.31 meters. 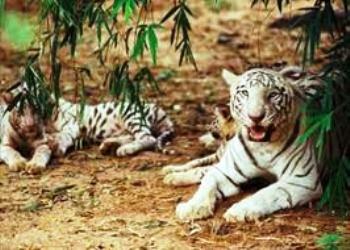 Simlipal Tiger Reserve is famous for best care of tigers in india. Set on a wide expanse of Sal forest, this park is nestled in the very centre of Mayurbhanj, the northernmost district of Odisha (Orissa). Notable variations in topography, conducive climate and required vegetation has supported large varieties of animals, birds and reptiles to flourish in one of the earliest and finest of India's 15 Tiger reserves falling under Project Tiger. A forested, hilly terrain 200 km south-west of Kolkata, the reserve is endowed with an exceptional biodiversity. Of the reserve's almost 1,000 species of flowering plants, 94 are orchids, many of which are on show at the small display at Gurguria.